Are we able to choose a common magic item from Xanathar's? It's an AL legal thing. I know you can buy them if you have the gold and I found a source about how if you use the "this is your life" tables you can start with a free portion of healing. Yeah, let me dig it up. Is it permissible to create a second character for season #3 and have them both as reserve. Whichever gets four players first, I'll use that character and the second gets nixed? This is the only source I can find anymore. Last edited by Nikolas; 12-30-2018 at 01:04 PM. I really can't believe I cut and pasted from post #6 and instead of editing it in this post... I overwrote the previous character. Last edited by MIniSchnauzer; 01-02-2019 at 04:59 AM. A brief description of your characters appearance, personality, and history: Renar is the heir apparent of an ancient elven dynasty, and is well known for his short temper and long held grudges for even small sleights. Contrary to his social idiosyncrasies he has a great ability to wait for a plan to come to fruition, as long as there are no screws ups. Renar has pale skin, and silver hair. A kind face which quickly shifts when his anger is irked is home to two violet eyes. His father has sent him away to work on his self control, but it may have backfired. 2 Personality Traits: I lost too many friends and I'm slow to make new ones. I have a crude sense of humour. Bond: I'll never forget the crushing defeat my company suffered or the enemy who dealt it. Description: Darron is a nondescript individual. He's average in height, with a somewhat lanky build and a decent amount of muscle on his body due to soldiering; he has shoulder length dirty-blond hair that he keeps in a sort of messy bun, and has a short and somewhat thick beard that frames his shallow face. There's a scar, somewhat deep, that runs obliquely across his nose, and although it's mostly healed over, the deep cut still shows a significant bend to the area, thus giving his face a somewhat lopsided look. When in gear, he's mostly seen wearing a chain hauberk underneath a yellow surcoat with two lobstered pauldrons and a gorget to protect his neck, and on his feet are spiked greaves. Personality: Due to past events, Darron is a very closed off individual with many, many walls. He isn't brooding by any means, in fact he's quite nice and sociable, however he does keep an emotional distance from others so as not to form any bonds with them. To him, others are simply assets placed in his life to help him accomplish whatever task he's been given. Nothing else. He fears forming bonds because of the pain that would follow should he lose anymore friends, or even worse, witness their deaths. Although he does talk and is very sociable, he will never disclose any personal information that isn't relative to their mission and will politely ask anyone that's prying to mind their own business. He's most comfortable with superficial relationships with others. Nothing that would ever go beyond acquaintances, and as long as others are willing to respect his boundaries, he's more than happy to share a few laughs with them. Especially by making crude jokes when the opportunity arises, since it's a way for him to cope with the heavy losses he's had to face, and to help relieve the tension in very serious situations. A habit he's learned from his company since they were mostly all making crude jokes at the most serious of times. He's also quite fond of dark jokes as a sort of way to wake his group up to the dangers facing them. Backstory: Darron was born in an unnamed village near Silverymoon to a pair of farmers. His early life was filled with hard work under the sun, tilling the earth, taking care of the crops, and herding their herds to graze on the land. It taught him strong discipline from a young age, but a part of him also wished he could have spent his childhood acting more like a child than an adult. Alas, it wasn't to be. His father was a strict but fair man, instilling a sense of duty and greater purpose in Darron, and had very little patience for goofing off. Thus, he would work with his father or even help his mother around the house with various chores, and by the time he had time to himself, it was mostly dark. At the age of fifteen, a conscription officer came to their lands and demanded that they hand over any abled bodies to the military. Darron was at first hesitant, but his father told him it would be good for him and that he himself was a soldier before settling on the farm. It took some convincing, but he signed up and was immediately taken to a fort to be trained. The training lasted for the better part of a year where he was drilled relentlessly, sleep deprived, and put into exhaustive and near life-threatening situations to prepare him for battle. Each day was a struggle, but with each passing month he found himself getting stronger and tougher, and getting closer with the men he'd considered brothers in his squad. By the end, he was a green but hardened recruit and the squad a close-knit family that acted as a single unit. They'd been given word that an orc warlord had brought the tribes together under a single banner and was leading a fullscale assault on the humans. What Darron assumed was going to be months of constant fighting and daily struggles in the pits of war, was actually nothing of the sort. Months at a time they would spend marching or fortifying a redoubt with the occasional clash with orc skirmishers. His first battle was a year later, when his company was sent to intercept a marching band of orcs that meant to assault a fort that had given the humans a significant strategic advantage; their orders were to hold back the orc forces until the fort could be fully resupplied and prepared for a siege. The battle was bloody and a mass of chaos and death. But, by the end of it, although they sustained several casualties, they managed to push back the orcs forcing them into a retreat. While camping that night, Darron was approached by his Sergeant who told him he was part of the Harpers and that he would love to have him part of the group. Darron said he would think about it, and a few days later decided he would join the faction. Several months later, he was promoted to Sergeant of his squad, and the company he was in was given the orders to lay an assault on another company of orcs that were threatening Silverymoon which had just won out of a siege at the time. During their march, Darron was approached by a fellow Harper who'd given him information that another orc company was seeking to flank them as soon as they engaged with the first. He told the officers and asked them to hold back and wait for reinforcements to arrive. Seeing that the information was from the Harpers, the agreed and settled in to camp. That night, they woke to see two orc armies waiting to run them down. They formed as quickly as they could, horns blaring through the night. A bloody mess followed with the human company shattered by the end. Darron lost many of his brothers that night, and those that survived either died soon after or blamed him for the false information he'd given the officers, even more saying that he was a conspirator with the orcs. The rumours began to fly wild with each passing and knowing that he would be executed if he didn't run, Darron fled and never looked back, changing his appearance and his name. He now seeks redemption for the trouble he's caused and the Harper's may need him once more. Last edited by Torack; 12-31-2018 at 11:35 AM. I idolize a particular hero of my faith, and constantly refer to that person’s deeds and example. Bond: Everything I do is for the common people. 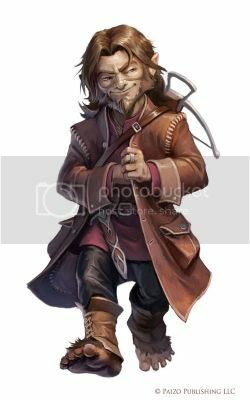 Appearance: Merwrick is average height for a halfling. His lean, muscular frame shows his athletic abilities. His dark brown hair covers his head and feet. His round hairless face has brown eyes that show an understanding of what his life is. He wears leather armor that's covered by a black overcoat. Leather gaiters cover the tops of his hairy feet. Personality: Merwrick is always optimistic. Although, he is not always altruistic. He really wants to move up the ranks in the Harpers and getting there is a high priority for him. Also, he isn't fast to trust strangers. History: Merwrick grew up an urchin on the streets of Waterdeep. Stealing what little he could to stay alive. It wasn't an easy life for a halfling growing up in a human world. The gangs of boys that ruled the streets often gave Merwrick a difficult time. He decided that the streets would not be where he would wander. So he took to the rooftops and learned how to survive from on high. On the rooftops he learned to overhear secrets from open windows and alleyways. Until he overheard one that would change his life forever. The overheard secret brought him into the folds of the Harpers and his hero and mentor Max Shadowfoot. Max tutored him in the ways of the Harpers as well as how to be a thief until his untimely death. Merwrick carries Max's ashes in a urn with him everywhere. 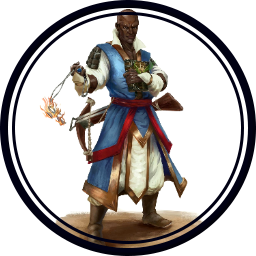 Now, Merwrick's contact for the Harpers is Zimakus Shadowfoot, Max's nephew. Last edited by McQuiggin; 12-31-2018 at 10:05 PM. Awww, this is what I was waiting for! AL adventures! I'd gladly make time for Season 4! Always wanted to try it after watching a few episodes of Dice, Camera, Action DMed by Chris Perkins on Youtube. I only got to about 2 or 3 episodes in so I didn't spoil myself yet. One question, though: Will multiclassing be allowed? My character concept for the adventure might call for a multiclass. 2 Personality Traits: I don't talk about the thing that torments me. I'd rather not burden others with my curse. I refuse to become a victim, and I will not allow others to be victimized. Ideal: I try to help those in need, no matter what the personal cost. Bond: I would sacrifice my life and my soul to protect the innocent. Flaw: I assume the worst in people, especially those who are different than I. Appearance, Personality, History: Tormur is of Mulan heritage and stands a good few inches past six feet. Unlike most of his kin who are lithe, Tormur is built like a bull. 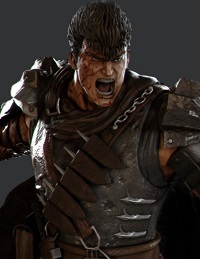 His years of being in the battlefield have marked his body and face with many a scar, the most notable one running the right side of his forehead down to his right cheek. 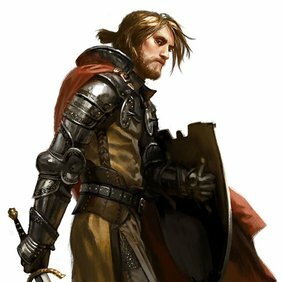 That scar came from when he briefly ran with the mercenary band known as the Brotherhood of the Griffon in Chessentha for fortune and glory. During one of his missions in the deep woods, while the soldiers were making camp, three women appeared before them. Their clothing and ornamentation suggested they were gypsies; nomads who moved around to where battles were waged and scavenged off the dead. They also had a reputation for being harlots, so most of the men welcomed their presence. It soon became apparent however, as they revealed their long, sharp teeth and razor talons that they were in fact, not gypsies, nor human at all. The camp was torn to shreds. In a short moment Tormur stood alone, shaken but with his sword raised, poised for defense. The three bruxae surrounded him slowly, speaking words he couldn't understand; their sharp-toothed grins growing ever wider. Tormur had flashbacks of the carefree life he had of soldiering and getting drunk over and over, and for a moment he thought that he would die without doing anything special with his life. That would've been the end, or so he thought. One of the monstrous woman shifted back to her "human" form, and approached him, still speaking with their unfamiliar language. She drew close, yet he stood there frozen, unable to move his arms to strike at her with his sword. He continued to remain still even as she raked a clawed finger over his face, unable even to scream in pain as she ran over his right eye. Then, opening her mouth ever so slightly, the woman leaned in towards Tormur's face. Whether it was to kiss him or kill him, Tormur couldn't say, and hoped he would never find out. At that moment silver dragonborn from the Platinum Cadre swooped in, driving the creatures back into the darkness of the night and forest. They belonged to the Platinum Cadre, and were supposed to meet with the Brotherhood at dawn, but the sounds of battle drew them. Impressed by the dragonborn warriors courage and skill at arms, Tormur asked to join them. Now the former mercenary has become a paladin of the Cadre, worshippers of the dragon god Bahamut. Though he was human, with black curly hair and brown eyes and looked quite alien compared to the rest of his brethren, Tormur was welcomed as a member without any hesitation. Life now had purpose and meaning for; it was to protect the light and serve life, as Bahamut desires. There were some nights that he would still dream of that incident in the forest; sometimes he would dream of the woman who had spoken to him. Other times he would swear that she would be just at the edge of his vision, smiling in a dark corner; he never found her there. Those nightmares and hallucinations left him in a cold sweat, but Tormur knew that Bahamut would protect him. Should he ever meet those monsters again, he would destroy them without hesitation, or die trying. For now, the young paladin steps into the Crossing Inn east of the village of Phlan, representing the Cadre in response to a call for help to resolve some strange phenomena happening in the region. Tormur had been traveling with another of his group; a silver dragonborn named Zamrez. Things got quite disorienting with the fog, however, and they got separated. Tormur scans the room from the dragonborn's familiar face, but does not find her. Perhaps she got more lost than he did? Nevertheless, she should find her way here eventually. For the meantime, Tormur pulls his hood back and shakes the dew off of his cloak, seeking some warmth and refuge inside. Last edited by Tinuviel; 01-06-2019 at 09:10 PM. @Nikolas Are you going to go for season 7 as MIniSchnauzer suggested earlier? I'm not sure, I might make a second app for the 7th season, but I don't think the barbarian would fit well there.